Members of the Land Stewardship Committee patrol the church grounds on a regular but unscheduled basis. These perambulations are instrumental in preventing vandalism, check for vagrancy, and gather important data for monitoring the flora and fauna of the grounds. Stewardship in its first and truest sense is not donating time, talent and treasure but attending to the things entrusted to us by the Master. Thus the Committee members take seriously that although they contribute or tithe to the church they find it more important to attend to the safety and security of the assets entrusted to us by the Archbishop, the pastor, the parish members and of course those that come from the Father. Twenty-four acres of land, a lively animal population, over three-quarter million plants, 192 species of native trees and bushes and orchids and thousands of resident and migrating birds . These random inspection trips have intercepted drug users, people attempting to camp out thinking the parish (because it is heavily wooded) was a KOA campground, assorted lover lane participants, some native seed thieves, two hot air balloon commercial operators attempting pick up of paying customers and many other "situations. Most incidents are harmless, a few are funny, and some pretty smelly as in the case of the parishioners that buried their dead pet cat under 1/2 inch of soil. Yuck! That was a stinky situation if ever there was one. August 30, 2009: So lets start with today, August 30th, 2009. The morning drive today was Ellie and Paul, long term members of the Land Stewardship Committee (LSC) in the John Deere Gator. It was hot, uneventful, and actually a lanquid sort of peaceful. Mockingbirds were about in great numbers and the first blue gray gnatcatchers were flitting in the trees. On these morning drives bird seed is placed in about 7 of the ten feeders widely separated around the grounds. A small collection of mottled ducks eagerly scooped up the starter feed and the blue heron and tricolor heron foraged by the banks of the east canal. But then a strange thing happened. A commotion in a tall cypress caught our attention and an inspection revealed a great egret, formerly known as common egret. Nothing unusual there since they are quite common on and around the grounds but this one was very busy pulling medium sized limbs together to form a nest pile. It is much too late in the season for nesting and the bird was solitary with no mate. Yet the activity went on for quite a while. How long? Well it started as the 7:45 AM mass was beginning and was still going on when the 9:00 AM was starting. How's that for a holy time clock? So? So, we don't know. It was still progressing with much fuss and very careful analysis of each branch. The activity was about 20 feet in the top of a cypress and near the middle of the branch. It was clearly visible to arriving and departing parishioners and several asked what we doing. Besides taking this picture, we were beholding the beauty of the Lord's creation. August 31, 2009: Another typical Florida Summer day. The population of mockingbirds continues to grow. This is the same observation we made in the Everglades Park and many birders are reporting similar experiences. This truly is the year of the MOCKERS. Our cottontail rabbit appears now and again and seems to find the Garden accomodations to its liking. Two ibis are night roosting on the large corner house across from North Beach. Where is North Beach? It is the extreme Northeast corner of the parish boundaries. In addition to the ibis a Great Blue Heron also roosts there every night. The house is a strange one. Very quiet...almost as if it is a house, not a home and for investment purposes. At any rate I would roost there also as the cypress tree of choice is solitary and provides a good view up all the canals. The Cooper's Hawk is still in the area. Just ask the dove. They are resident experts on that topic. The hawk was sighted recently sitting atop the soccer goals in the school play field. Cute! Mottled duck numbers are increasing. Now 12. You can tell the new from the old by watching which come to the corn feed. Today was also a red-letter day with a small flock of waterthrush. Five in number flitting along Canal Street. It was still dark (7:05 AM) but the field markings suggest Northern water thrush. No sighting on the cottontail rabbit now for 6 days. Anhingas are in creasing in number and cormorants also.The Garden is wet from the thunderstorms of the previous three days. A red letter today. Early morning patrol (6:30 AM) disclosed one peregrine falcon fighting with a red-shouldered hawk. The battle centered in the first parking lot east side with mockingbirds, brown thrashers, cardinals and woodpeckers coming to join the fray. Eventually the falcon and hawk flew across the canal and things got quiet. Small warblers now abundant on all trails and the mottled duck flock is increasing in number. The two ibis still perch on the cypress at "North Beach" but are now joined with our seasonal visitor the osprey. A single great egret continues to work the weed line along the canal as do a tri-color and a little blue. Blackbird numbers are increasing. Water table is up again following the torrential rains of Saturday and Sunday. More rain fell this day also. We have three cute raccoons. One is very tawny in color while the other two are standard black and gray. The lttle tawny one does not give away to the other two bigger ones. Occasional growling in the night establishes priority in feeding and privilege in rank. The raccoons move among the ducks with abandon and they don't seem to mind. I don't suppose they want to push their luck too far, though. So where is the red letter? Well a lovely lady by the name of Lucy brought her camera equipment and came to the Garden. She was treated to a dove that came so close to her she couldn't focu upon it. The bird then flew up and landed on her telephoto lens. If that don't beat all! But after gently brushing the bird off on to the picnic table it flew up to her shoulder. She passed the camera to Land Stewardship Worker Bob Betz who took a picture of her and the dove walking away into the Hammock together. and tells me I am His own....."
You just don't know what will happen when you come to the Garden to pray. What? You doubt this happened? For shame! Activity is increasing at Hoechoka Hammock (Sawgrass and University). This morning my wandering revealed a screech owl on top of the chickee hut. It was using the "whinny" call which is spooky if you never heard it but Old Florida if you have been around for a while. Such a melody! Warblers are primarily prairie with a few pine. Two osprey are now in residence in the trees at what we call north beach. A Cooper s hawk is still present and moves with great foresight and wisdom before you can observe for a while. Red winged blackbirds are increasing in number but not too noisy. Dove are stable in number. It is tough to track them now as we have widely dispersed the feeders to avoid congestion and make the Cooper's hawk earn his living the old fashioned way. More mottled ducks have arrived and finally the waterways on three sides of the church property at Hoechoka Hammock resounded to the cacophony of the quacks. The numbers are up to 22 and they realize that they outnumber the Muscovy. But, duck nature being what it is they fight one another with the same vigor they fight the Muscovy. Tree frogs are also appearing now. It is the Cuban Tree frog but considering we have been building the hammock area for 12 years it is nice to finally welcome them aboard. The bromeliads torn to pieces attests to the fact that the raccoons are searching them out in the cup of the plant. Recently we received 6 cubic yards of Hogan Tree company mulch from a job site certified as "all native vegetation." It has since been processed through the church mulchers (McKissacs)to reduce it in size. The result is a highly manageable pile of all native-rich-with-seed mulch that will be placed around the property to continue the ever expanding hammock building. The mottled duck population is still holding at 22 birds. They are becoming more accustomed to the muscovey and asserting themselves. Actually they fight more with each other than the muscovey. Since moving the feeders around a little we have successfully dispersed the birds. An evening patrol this day showed mourning dove at 5 different locations, mockingbirds in great numbers all over, score of gray squirrels, a pesky cluster of blue jays and several raccoons. The evening are cooling now and large buildups of cumulous clouds foretell rain this evening. The grounds received two downpours today. The red-shouldered hawk could be heard several hundred feet into the wilderness area. Turtles now appear regularly at the duck feeding stations. They don't come from the water far enough to get a positive identification. I often muse on how each evening patrol is like a movie and the grounds is the stage. The picture may have the same actors but the plot is different. We anxiously await the migration and the appearance of red starts and blue gray gnatcatchers gives us hope it will be soon. The mottled and muscovey ducks were strangely quiet and hung off-shore this evening by about 15 feet. There was not the usual scrable to get to the shore for the expected grain handout. The reason became suddenly clear when a bobcat broke cover and walked in front of our Gator vehicle, gave us a long stare with a nonchalant attitude and then disappeared into the scrub palmetto. I concluded that it was probably drawn to the smell of the ducks that feed at the same place morning and evening. A bobcat now adds a whole new risk aspect to the life of the muscovey. Earlier this day we had a cooper's hawk fly-over, about 15 white ibis, several yellow bellied turtles, 30+ mottled ducks and considerable number of doves. Blackbirds are also increasing in number. Two osprey still hang out in the tall cypress and the anhingas now number 7. Blue gray gnatcatchers are becoming common and prairie warblers are not unusal. The morning and evening are cooler and the mosquito population is plain tolerable. One of the female raccoons is swelling in the belly and best guess is that she will have babies soon. No sight of the rabbit in the last 5 days. I'll have to ask the bobcat about that. The Land Stewardship Committee can hardly wait for winter. That is the season of tours, cookouts, and general good times in the Garden. The cool weather helps us forget the heat and humidity of the summer. Pepsi & peanuts around the firepit. It just about doesn't come any better than that. Evening patrol was cool and quiet. The muscovey are now overwhelmed by the sheer number of mottled ducks. And to whiten the party a little at dinner time a flock of 35 white ibis joined in. We were graced again with another sighting of the bobcat that met us at the junction of Country Road and Canal Street. It paid us little attention but walked slowly on its way back into the palmetto wild area. The bluejays plotted the path by tracking the journey and calling out warnings to other birds. Our cottontail rabbit appeared this morning on the school side of the fence enclosure. Some of the children, not yet schooled in the ways of Land Stewardship began to chase it. The science teacher intervened. She has her work cut out for her. We are glad to hear that the rabbit is alive and well....now we have to teach it to stay on its own side of the fence. The Gym teacher had a group on a health walk through the woods today and were graced with a view of the bobcat. For some of these children, born and raised in suburbia that should have been a wonderful experience. The path way from the playground, down Country Road, down Canal Street and back on Runway is a premium nature experience for the children. Drawing, photography, plant identification and many other studies come to mind for all grades from k-8th. The Land Stewardship Committee and the good people of Mary Help of Christian have built it. Now, will the teachers come and excite the children to learn? A beautiful full moon this evening and the grounds were alive with the sounds and activities of many creatures. 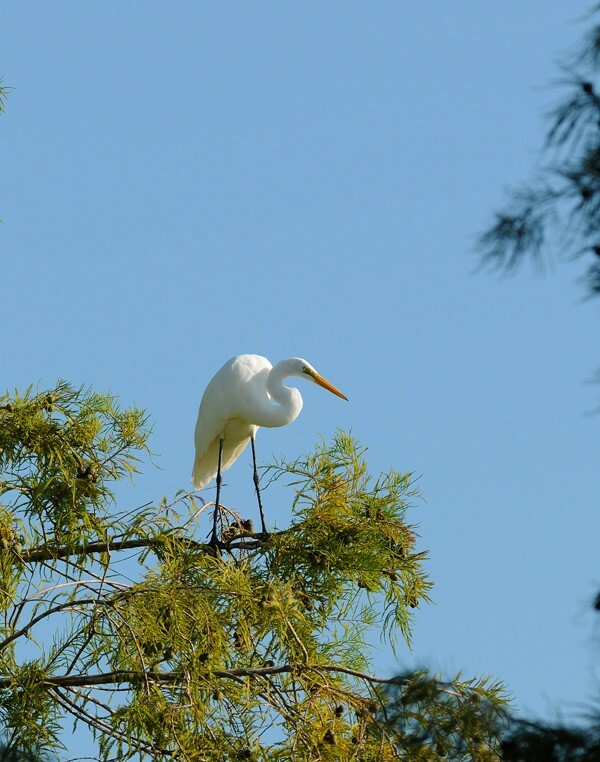 Tree frogs called from the cabbage palms, mockingbirds abounded everywhere, and the canal was filled with ducks, and now two great egrets as well as tri-colored herons, several little blue herons and solitary snowy egret. When the ducks suddenly grew silent we knew the direction of their stare pointed out the location of the bobcat come for an evening drink. Sure enough there it was. It quietly retired to just lie down and watch the evening progress. And we did too until the quality of light went below our viewing ability. It was a jarring shame to have to crank up the engine on our John Deere Gator. As we returned the equipment to the chickee cover we "shined" the eyes of raccoons darting to and fro across our return route. Could St. Francis provide anything better? November was an interesting month. Two of the female raccoons appeared one evening each with four babies. From their size and weight we guess that they were birthed sometime in Early October. Both females were compatible and the babies tussled and played with one another indicating that the mothers were probably related. The families displayed the usual signs of healthy animals: cautious, robust, good discipline, standing on hind legs to get a better view, and most importantly alert to sounds and signs beyond human recognition. We know something is different or coming when the raccoons stop, look in the same direction and the ears point forward. A little "chuck-chirr" from mother raccoon sends the babies up the nearest tree and she places herself at the base for defense. The intruder is usually "Brownie" yet another raccoon with very distinctive brown color and a face that makes you think Corgy dog. A cute little undersized creature that has a habit of growling. Well, it learned the hard way not to play that card with two mommy raccoons that mistook its character defect as a sign of malice and pummeled poor Brownie from here to the next week. We have not seen Brownie ever do that again. The LSC was on full alert this weekend guarding the flora and fauna from the vagaries and actions of the carnival workers and the crowds that they attract at what has been institutionalized as a "money-maker" for Catholicism. For the most part the duty consisted of throwing pot smokers, drifters, and some ner-do-wells from the premise all of whom has a assorted stories as to why they should be hiding or lurking in the bushes. The smell of food must have been maddening to the four-legged critters. The birds just moved east and deeper into the wooded area. One luckless squirrel paid the ultimate price of increased car traffic as hundreds of cars and thousands of people trammeled the grounds. It became part of mother asphalt! Our poor cottontail rabbit got caught in the open on numerous occasions and exhausted itself fleeing from carnival attraction to carnival attraction. Pity the creatures of God. Cleanup was less than contracted for (it always is) and as the carnival moved on to make more money from the adoring public the LSC set about reclaiming the land. What a mess! The outdoor mass for Thanksgiving was moved indoors as persistent rains continued all morning and well into the night. Such a pity as the LSC spent over 75 hours labor making the arbor-gazebo area so pretty. Oh well, the butterflies said thank you. The bobcat has been absent now for about three weeks and there are no signs of its presence. We have concluded that the creature moved on to better hunting grounds. There certainly are enough cat and dog food containers around this area to support it in the manner to which it would love to become accustomed. The cold front that followed the Thanksgiving rain put some color into the maple leaves. Orange and red are prevalent. The Sweet-gum is all yellow and so are the popash. Coffee is fruiting as never before seen and we sampled out first honey from the bee hives. As that famous comedian Jackie Gleason once said: HOW SWEET IT IS! We wonder, how many parishes in the Archdiocese of Miami can have honey from their own bees. The fall migration is moving ahead sl owly. Today the Downey woodpecker stopped in to check out the lightning struck gumbo-limbos and found a treasure trove of carpenter ants. Good for the bird and bad for the ants. A cool morning to watch the sun rise and hear the sound of mottled ducks dabbling in the canal. The grackles, red-winged blackbirds and starlings descended by the flocks to ravage the feeders and otter played along the banks. "2-mommies", as we call the double raccoon family appeared and walked cautiously to the water edge to drink. What a blessed sight to see seven raccoons lined up drinking in the peace of the morning. They startled at the approach of a "cheeky" squirrel, one of the many that has played death checkers with red-shouldered hawks and won. In a moment the squirrel too was drinking and the ducks watched. And God said: "Behold I have given you every manner of beast..." Yep, you sure won't get an argument from the Land Stewardship Committee. Our resident doves with their northern visitors "wing-whistled" in for their share of the bird seed and are quite insistent at sitting at the table. The sight of a mourning dove pushing into a feeder dispels any vision you might have of the adage "peaceful as a dove." Off in the distance the red-shouldered hawk announces its "keer-keer-keer" call. The poor creature hasn't learned that if it keeps its mouth shut it may keep its belly full. At the call, the doves headed for bush cover and the squirrel retreated to the deep woods. Finally the sun clears the roofs of the ornate far too large houses to our east and the morning chill disappears. Time to get to task. The age old "Martha-Mary"; question. There are so many stories in the Garden at Mary Help of Christians. Some are quite funny and occasionally they are captured on film. Take this incident this early morning. Bird feeding stations are spread out around the 24 parish grounds to avoid the birds gathering in just one area and being fine targets for predatory hawks. Each feeder is close to water and cover and there are a variety of foods such as peanuts in the shell, sunflower seeds, millet, cracked corn, etc. This morning we were running the John Deere Gator at a very low rpm and came up quietly on the feeding posts that is elevated some 5 feet above the ground to avoid dampness and looting by raccoons and squirrels and o'possum. As we came around the turn that hides the feeder from normal sight what do we find, but one very young baby raccoon exploring what the dove were getting into. Now don't those eyes just look guilty? Sort of like a child with his hand in the cookie jar? Members of the Land Stewardship Committee patrol the church grounds on a regular but unscheduled basis. These perambulations are instrumental in preventing vandalism, check for vagrancy, and gather important data for monitoring the flora and fauna of the grounds. Stewardship in it first and truest sense is not donating time, talent and treasure but attending to the things entrusted to us by the Master. Thus the Committee members take seriously that although they contribute or tithe to the church they find it more important to attend to the safety and security of the assets entrusted to us by the Archbishop, the pastor, the parish members and of course those that come from the Father. Twenty-four acres of land, a lively animal population, over three-quarter million plants, 192 species of native trees and bushes and orchids and thousands of resident and migrating birds . These random inspection trips have intercepted drug users, people attempting to camp out thinking the parish (because it is heavily wooded) was a KOA campground, assorted lover lane participants, some native seed thieves, two hot air balloon commercial operators attempting pick up of paying customers and many other "situations. Most incidents are harmless, a few are funny, and some pretty smelly as in the case of the parishioners that buried their dead pet cat under 1/2 inch of soil. Yuck! That was a stinky mess ! January was a record cool month with frost three times on the Church grounds. The temperature fell to 30, 32, and 30 on three separate days with no great detrimental effect on the plants as the LSC controlled the temperature with the judicious use of sprinklers at dawn. The freeze had a significant detrimental impact on the Lac Scale, white fly and Lubber grasshoppers. The mottled duck population has increased and now remains steady at 125 ducks. The muscovy, normally very aggressive have decided that discretion is the better part of valor and "share" the morning and evening feeding. Peacock bass are also appearing in greater numbers as well as a variety of turtles. The raccoon population now is 7 and our favorite "brownie" with the crippled left front paw has learned to growl and jostle its way to the front among the raccoons . The Land Stewardship Committee members have not seen our cottontail rabbit for the last 4 weeks. We suspect that it has moved on or passed on. That's a pity. It was such a gentle sight to see on early morning patrols. Extensive repairs have begun on the picnic tables, benches and wood memorial platforms. The upgrade, repair and replacement should be complete by July. The original woodwork has lasted 13 years so the LSC has no complaint. Considering the sun, rain and extensive use, the committee feels that the original donors got their money's worth. The vegetable garden is showing deterioration as the heat builds. First we had one of the coolest winters/spring on record and now we learn that June is the hottest month ever recorded in Broward County. A gigantic high pressure is blocking the prevailing east winds and the daily temperatures are 93-98 with 70% humidity. Even the orchids are "shutting down" and the flowers wilt and discolor three days after opening. All we have left in the Garden for vegetables now are herbs and onions. Even the radishes don't like this weather and that is saying something since they basically are roadside ditch plants. The Fathers; Day memorials this year were a mixture of Hamelia patens, some Florida slash pines as well as crotons. Crotons are not native vegetation but you can overlook the bias against them by recognizing that since the leaf is the color and not the flower they can't be beat for color accent on an altar. And by the way, didi you know that croton leaves provide much of the color decor for the Rose Bowl floats that are required to have only botanical products decorating them. Crotons are the only source of black leaves. What a delightful surprise! For the first time on the Church property a lovely petite little ground orchid with the name almost as long as the flower stem Habenaria Odontopetala appeared today in close proximity to the Andrew Memorial. This ground orchid sports an ovid tuber of glossy green color just barely below ground surface A sparsley flower raceme with 20 yellow-green flowers. The flower stem is so slight that it blends in with all surrounding vegetation. H.odontopetala is the most common of Florida woodland ground orchids. Dr. Luer describes it extensively in his volume on Native Orchids of Florida at page 154. Although common to the Caribbean and Florida as far north as Jacksonville, this is the first time that the Land Stewardship Committee has found the plant in Hoechoka Hammock. A new parishioner in the plant community. Welcome aboard! Picture to follow as soon as we get the goods light with no rain. A new bird has appeared among the mottled ducks at the morning feeing. 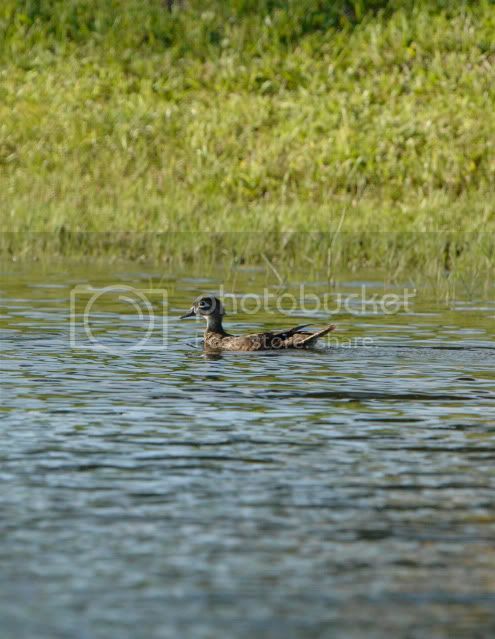 It appears to be either an immature Black-bellied whistling duck or perhaps an immature wood duck. It is only seen in the morning flock that floats in the canal along Canal Street. The morning sun reflecting off the surface of the water makes clear viewing very difficult---and of course you never have a pair of binoculars when you need them. Very hot this early morning. By 7:30 AM the temperature was already 84 degrees and promises to be near 96 by noon. The fledgling blue jays are all over the property as are the baby blackbirds, grackles, and dove. This is the time for "growing up" and the parents can be seen taking the babies from one feeder to another. Sort of an education game. Here at MHOC we have feeders at many diffrent places so the birds get used to flying all over the 24 acres. Their passage back and forth is a constant reminder to the parishioners that God's love and beauty is all about. A different duck has been spotted the last two weeks in the east canal adjacent to Canal Street. 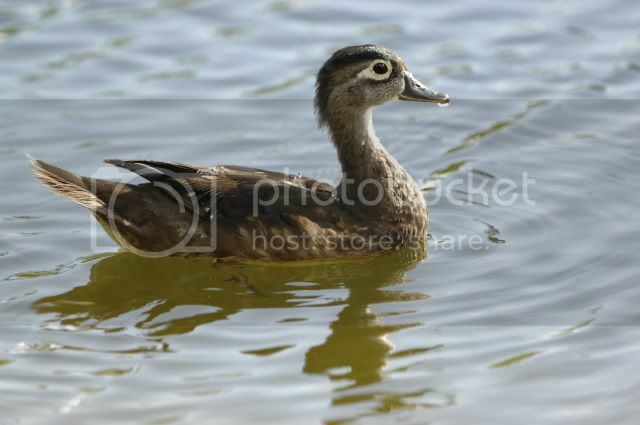 It is shy, and will mix it up with the mottled ducks but breaks away if approached. The bird was most frequently seen at 6:30 -7:00 AM in the morning and the glare of the early sun made spotting difficult. This evening, however, we caught the critter along the shoreline and took it by surprise. As it swam away it had a peculiar coot-like head movement and retreated very fast. We managed to get three quick pictures and it turns out that Mary Help of Christian now is home to a WOOD DUCK. How many ducks does it take to make a flock? If it's three then we now have a flock of wood ducks at Hoechoka Hammock. Three came in to feed this forenoon. All females and all about the same age. Is somebody raising and releasing these? We also enjoyed a nice visit from Lorraine Bertone and Clint Grethen, two representatives from the Broward Environmental Protection and Growth Management office. Hopefully the site will become part of their inventory list of places to see for native vegetation and landscaping. With 24 acres and over 500,000 native trees/bushes/ground cover and orchids of 131 species we might just qualify. And of course it remains very hot---but 6 degrees cooler inside the Hammock. Think not? Come and see. Such a sadness. Our wood ducks have left. Eat and run and not so much as a "fare-the-well". Pity. We could have all had a good time watching them mature. A banner day for the Land Stewardship Committee. Lorraine Bertone and Clint Grethen from the Broward Environmental Protection and Growth Management Department of Broward county toured the The Garden. Both of these people are Natural Resource Specialists and very familiar with Native Vegetation. Clint Grethen noted that, "It is truly a beautiful example of a site well managed as an ecological site and nurtured ... by your patrons and volunteers." The Jamaican Dogwood just finished its splendid floral display which in itself is remarkable. But add a cardinal too it and you have a caramel sundae with a cherry on top. The rainy weather of the lasy two days has settled into the Bay of Florida and the circulation has begun closure. This means that we will probably see a tropical depression by Wednesday. Meantime heavy rain continues into the second day now and is quite welcome to help defray the precipitation deficiency for the year. A cooper's hawk overflew the Garden this noon and on Saturday, four days past, a fast running canine like animal was seen briefly as it broke cover and crossed over Country Road. Too big for a raccoon, too fast for a opossum, leaving it to be either the now legendary coyote reported in Parland or the return of the grey fox to the land. Our three wood ducks are back again. The parish enters the summer with several major surprises. First the mottled duck (1 of 2) returned with four baby ducklings. This represents the first successful clutch of baby ducks on the church land. Additionally 8 more adult mottled ducks joined two white ibis at the feeding trough. And if that wasn't good news enough here comes mother raccoon with three little babies on their first outing. It had to be their first time out as they bumped into each other, branches, sticks and several logs. Mom is still nursing them and it will be several weeks until they learn how to forage. Right now all they want to do is see the world. They are the cutest little creatures and we hope to have some pictures soon. And then, here to visit or stay is a cottontailed rabbit. We haven't seen one of those since last year Spring. Wow. The joint is jumpting. Not to be outdone, two pair of Brown Thrashers are nesting on the church grounds and last week three otter put in an appearance.